Dracaenas are a large family of plants prized for their ability to thrive indoors. 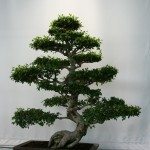 While many gardeners are happy to just to keep their dracaenas as houseplants, it’s possible to make things much more interesting by training them as bonsai trees. Keep reading to learn more about how to train a dracaena as a bonsai. Dracaena marginata, commonly known as a Madagascar dragon tree or red-edged dracaena, is the species that’s most frequently trained as a bonsai. In the wild, they can grow to 12 feet (3.6 m.) in height, but if kept in a small pot indoors, they should stay small. If you want to train a dracaena as a bonsai, start by laying the potted plant on its side in the bright sun. Over the course of several days, its branches should start to grow up toward the sunlight at a 90-degree angle from their previous growth. Once this process has begun, turn the container right side up again and rotate the plant every few days to encourage the branches to grow in whichever direction you wish. Light wire can also be used to tie branches together and train them into a desired shape. The way you go about dracaena bonsai pruning depends upon the shape you want your plant to achieve. Trim tall branches to achieve a low-growing look, or trim away lower leaves for a taller, swaying appearance. Dracaena plants do remarkably well in low light. After you have trained your plant into its desired shape, move it out of direct light. Not only will the plant prefer this, but it will slow its growth and help keep it a manageable size. Water your plant once a week or so, and keep humidity high by placing its container in a shallow dish of water and pebbles.